The time series of wave height, period and direction come from the NOAA WaveWatch 3 multigrid (NWW3) model. There is information about the model here. The data were extracted for the node in Pegasus Bay at 173° E 43.5° S, as shown in the map to the right. 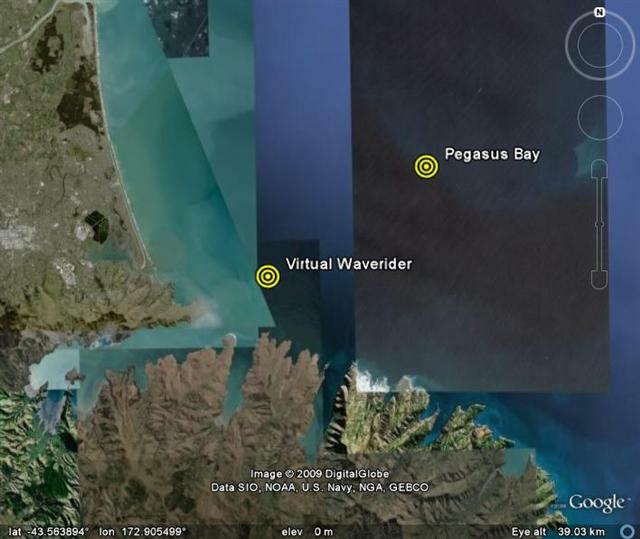 The table below shows the statistics of the waves that occurred from 1-Mar-1997 to 31-Dec-2008 at the Virtual Waverider node of the MetOcean local area wave model, 13.6 km inshore from the Pegasus Bay node of NWW3. Unfortunately, there are no historical data available for the Pegasus Bay node. At the top is a row of percentages with corresponding heights. These are the green dashed lines on the forecast. They are called percentage exceedance values. For 0.1% of the time, waves exceed 3.06 m in height. Conversely, for 99.9% of the time, waves are less than 3.06 m in height. For 50% of the time, the waves are under 0.85 m in height. This means that if the forecast wave height is at or below the lowest green dashed line, the sea will be slight relative to the conditions that normally occur at this site. But if the forecast wave height is above this line, the sea will be rough, and if it is above the top dashed line, it will be extremely rough. The body of the table shows the statistics of the direction of the waves. For 50% of the time (first column), the predominant wave direction is NE to E, with more than 60% of waves coming from this quadrant. The remaining waves come from all directions. As the wave heights increase, the NE to ENE sector becomes more dominant, and the largest waves are predominantly from this sector (84%).